Five people, including a Jersey City firefighter who ran into a burning building while off-duty, will be honored with Valor Awards at the annual 200 Club of Hudson County luncheon later this month. The five — New Jersey Transit Police Officer Victor Ortiz, Jersey City Firefighter Luis Colon III, and Jersey City Police Officers Ameer Alateek, Juan Rivera, and Miguel Ramirez — were selected for the honor from dozens of nominations submitted by state, county and local public safety organizations. The club will also recognize 12 officers for Valiant Teamwork awards for incidents in which three or more officers were involved. The club will also present scholarships to the winners of its contest and other contests sponsored by law enforcement associations to aid youngsters heading to college. The luncheon will be held at noon April 26, at Liberty House in Jersey City. In addition, the outstanding coordinated efforts of Hoboken police, fire and EMTs, backed up by other agencies, during the train wreck at New Jersey Transit Hoboken Terminal in September will be recognized. Timothy Gallagher, Special Agent-in-Charge of the Newark office of the Federal Bureau of Investigation will be the featured speaker. 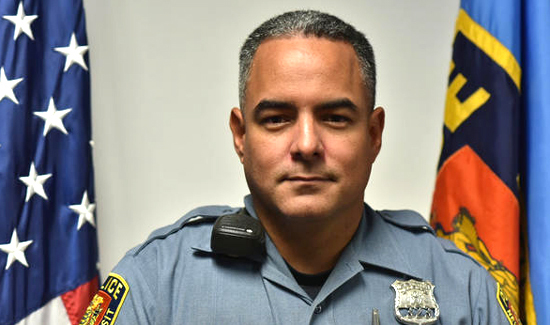 Ortiz earned the Valor Award for an incident in August in which he jumped onto the tracks, despite an oncoming train, to rescue a distraught man. Colon was off duty in July when he ran into a burning building to save the life of a 4-year-old girl trapped on the top floor. Jersey City Police Officer Ameer Alateek will be honored for a March 2016 incident in which he stopped a carjacking at Montgomery Street and Kennedy Boulevard. Fellow JCPD officers Juan Rivera and Miguel Ramirez will be cited for their capture of the armed driver of a stolen car in January 2016. Jersey City police Capt. Michael Kelly, commander of the West District, and ESU Officers John Boamah, Juan Bonet, Michael Camacho, Joseph French, Emilio Ramos and Michael Spolizino will be honored with Valiant Teamwork awards for their part in defusing a hostage situation in February 2016. Stevens Institute of Technology Police Officers Timothy Legowski, Sgt. George Martinez and Capt. Thomas Maggi will be cited with Valiant Teamwork awards for their work in emptying an apartment building on Washington Street near the campus last October. Bayonne Police Officers Christopher Denoble, Joseph Kowalski and Vincent Mattielli will also receive Valiant Teamwork awards for helping an elderly man and a toddler reach safety during a five-alarm fire on Broadway in January, 2016.